Moving to Boca Raton is a luxury that everyone dreams of experiencing. Three Boca Raton condominium communities can turn that dream into reality by providing affordable living to all. With an ideal location near the Intracoastal and the Atlantic Ocean, Waterfront condos at these prices are rare! Boca Towers Condominiums are some of the best-valued waterfront real estate that you will find in Boca Raton. Sitting right along the Intracoastal Waterway, Boca Towers offers incredible views of the water from its 17-story building. There are currently ten condos for sale in Boca Towers. You can snag a condo with one bedroom and one bathroom for just $264,900! Condos for sale in Boca Towers range in price all the way up to $599,000. You will get between 635 and 1,321 square feet of living space, complete with beautiful upgrades, and luxury community amenities. Unique to Boca Towers, your furry friends are allowed! If you have a pet to accompany you to the gorgeous beaches, moving into Boca Towers will be the perfect fit. If you would like to browse all condos for sale in Boca Towers, click here. The San Remo Club of Boca Raton is a friendly beachfront community situated right along the Intracoastal Waterway. With five stories and 295 condominiums, this gorgeous gated community has a lot to offer. Choose from newly renovated condos with spectacular upgrades and stunning views of the Atlantic Ocean, Intracoastal, or surrounding tropical landscaping. There are sixteen condos for sale in San Remo Club ranging from condos with one bedroom and two bathrooms for just $203,500 to a two bedroom, two bathroom condo for $434,000. Condos in San Remo are between 687 square feet and 1,250 square feet. 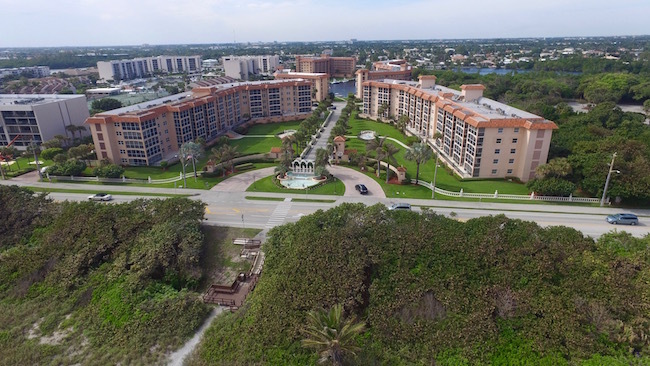 The San Remo community provides incredible amenities such as private beach access, and an exclusive clubhouse with a broad range of activities for residents. Please click here if you would like to view all of the condos for sale in San Remo. La Fontana is a luxury waterfront community nestled between the Intracoastal Waterway and the Atlantic Ocean. Stand on your private balcony and take in the fresh salt air, while looking out into the tropical scenery. Living in La Fontana is like living in paradise being just steps away from a private beach at all times. There are eleven condos for sale in La Fontana, and one could be yours for just $474,000. Prices range all the way up to $779,900 and include 2-3 bedroom floorplans. Residents of La Fontana enjoy many resort-style community amenities, as well as surrounding city nature preserve parks. You can click here to continue browsing all condos for sale in La Fontana.